ISS brings more than 30 years of experience in governance and RI research, providing comprehensive solutions that enable investors to develop and integrate RI policies and practices into their investment decisions, inform company engagements, and execute upon these policies through end-to-end voting. Responsible investing is a growing discipline, as companies and investors work together to integrate policy and practice to create long term value. 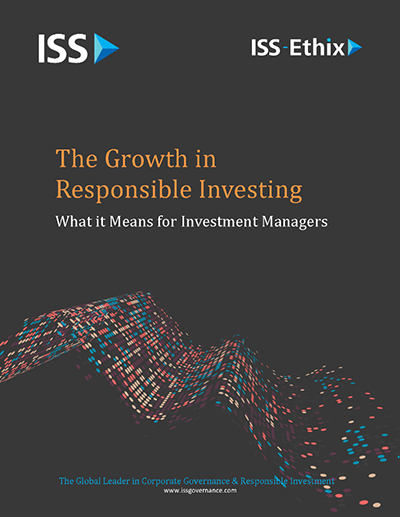 According to the Global Sustainable Investment Review, the growth in Responsible Investment (RI) assets in the U.S. between 2012 and 2014 reached 76%, and we believe this trend continued in 2015. This trend, combined with the rising number of RI and Environmental, Social, and Governance (ESG) related questions in RFPs, has investment managers wondering how to meet asset owner demands while maintaining the integrity of their current investment process.